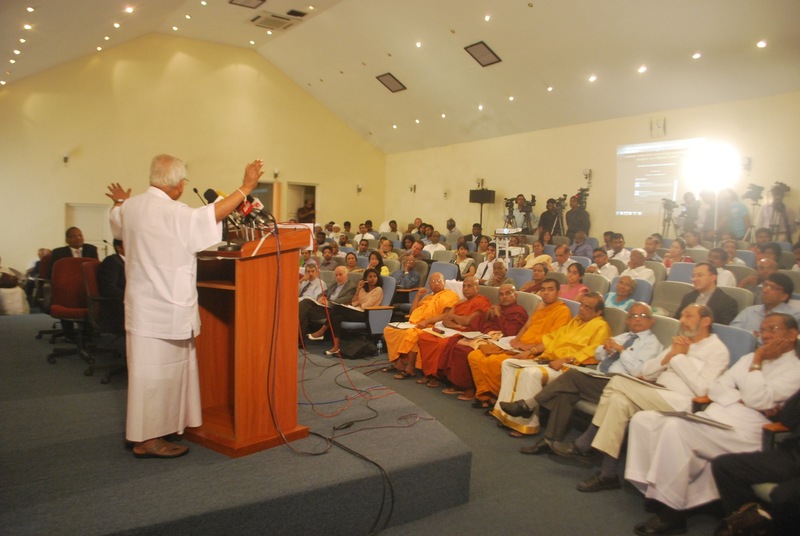 “Providing a leadership that heals the wounds of war and transforms the structures of governance into ones that meet the aspirations of both the ethnic majority and minorities is the continuing challenge for our beloved country” Dr. A. T. Ariyaratne, the founder-president of Sarvodaya Shramadana Movement stated delivering his keynote speech at the National Conference on Role of Religion in Reconciliation organized by Lakshman Kadiragamar Institute for International Relations and Strategic Studies (LKIIRSS). 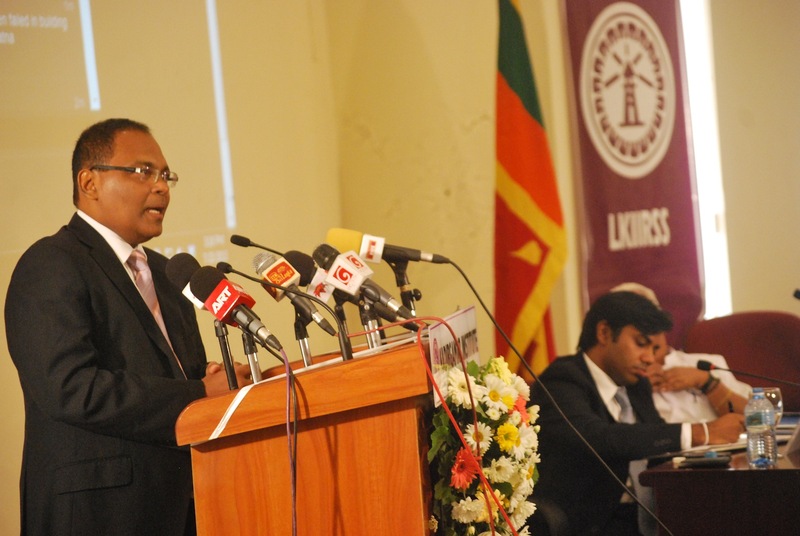 Dr. Ariyaratne was warmly welcomed by the distinguished crowd headed by Mr. Asanga Abeyagoonesekera, the Executive Director of LKIIRSS. The Minister of National Languages and Social Integration, Hon. 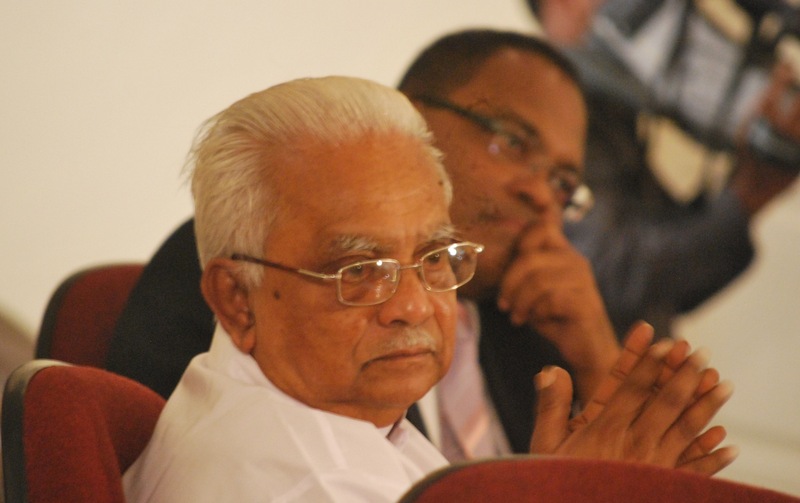 Vasudewa Nanayakkara, Ven. 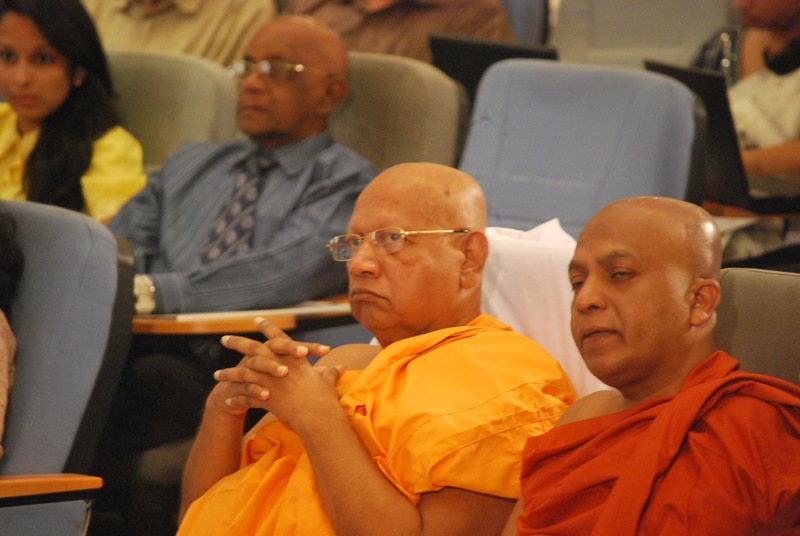 Professor Bellanwila Wimalarathana Thero, Rev. Fr. Benedict Joseph, Ven. 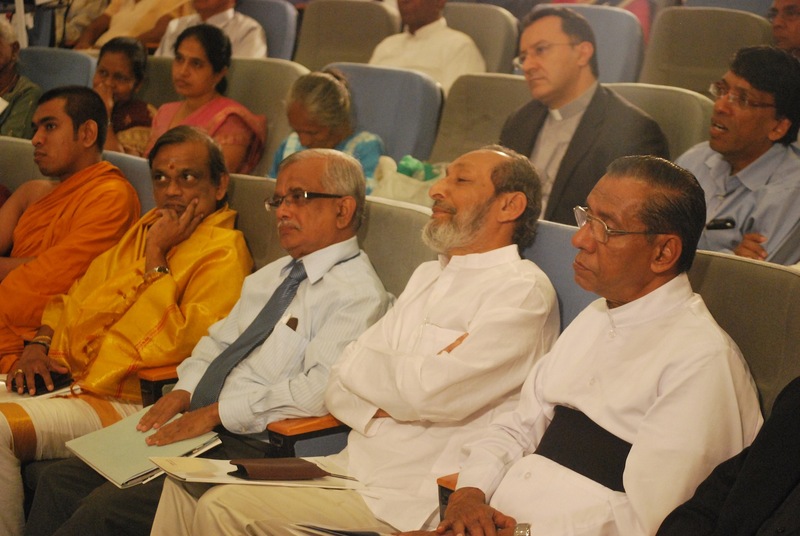 Ramachandra Kurukkal Babu Sharma were among the distinguished participants. 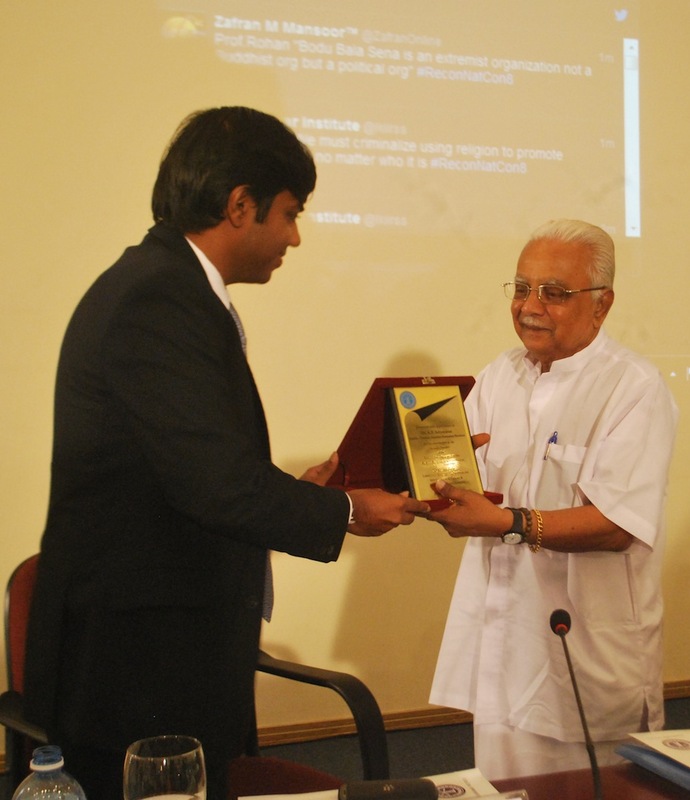 Professor Rohan Gunaratna, the Head of International Center for Political Violence and Terrorism Research, Singapore, also spoke about the ‘Context of Religious Reconciliation’. 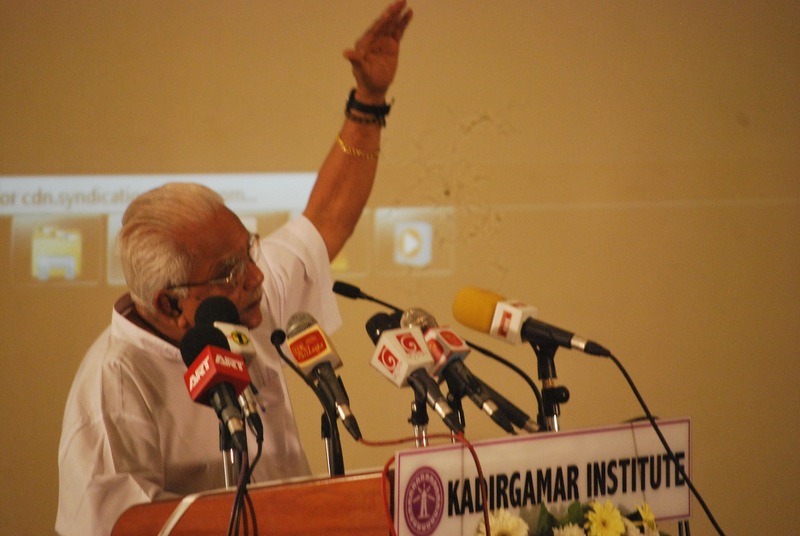 To read the full speech of Dr. A. T. Ariyaratne please click here. “යුද්ධයෙන් ඇති වූ පීඩාවන් සුවකිරීම සදහාත් මෙරට වාර්ගික බහුතර හා සුළුතර දෙපාර්ශවයේ අපේක්ෂාවන් ඉටුකිරීම සදහාත් පාලන ව්‍යූහයන්ගේ වෙනසක් ඇති කිරීමට නායකත්වය සැපයිය යුතුයි”. යැයි සර්වෝදය ශ්‍රමදාන සංගමයේ නිර්මාතෘ මෙන්ම ගරු සභාපති ආචාර්ය ඒ. ටී. 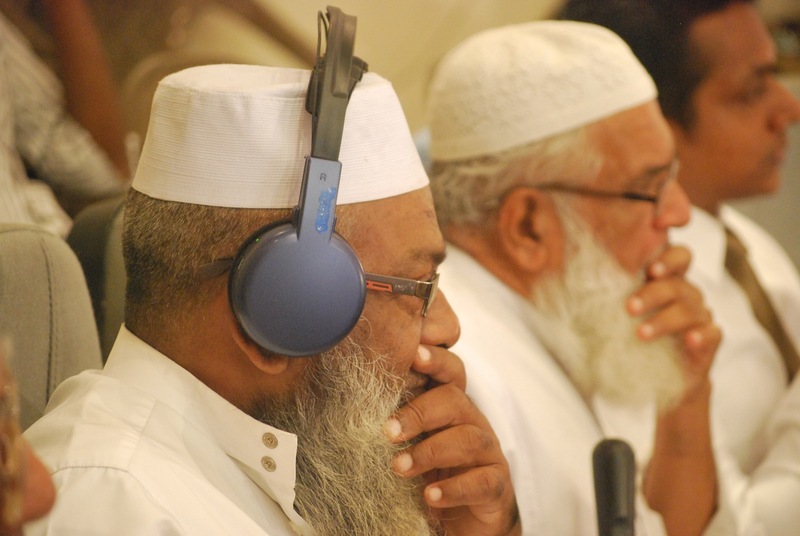 ආරියරත්න මහතා “ජාතික ප්‍රතිසංධානය සදහා ආගමික භූමිකාව” තේමා කොටගත් ප්‍රධාන දේශනයක් සිදුකරමින් කියාසිටින ලදී. 2013 ජුලි 23 වන දින ජාත්‍යන්තර මිත්‍රත්වය හා ක්‍රමෝපායන් අධ්‍යයනය පිළිබද ලක්ෂ්මන් කදිරගාමර් ආයතනය (LKIIRSS) විසින් මෙම ජාතික සමුළුව සංවිධානය කරන ලද අතර එම ආයතනයේ ශ්‍රවණාගාරයේදී මෙය පවත්වනු ලැබීය. සමුළුවේ මුලසුන හෙබවූ ජාත්‍යන්තර මිත්‍රත්වය හා ක්‍රමෝපායන් අධ්‍යයනය පිළිබද ලක්ෂ්මන් කදිරගාමර් ආයතනයේ විධායක අධ්‍යක්ෂ අසංක අබේගුණසේකර මහතා විසින් ආචාර්ය ඒ. ටී. ආරියරත්න මහතා උණුසුම් අයුරින් පිළිගන්නා ලද අතර ජාතික භාෂා හා සමාජ ඒකාබද්ධතා අමාත්‍ය වාසුදේව නානායක්කාර මහතා, අතිපුජ්‍ය මහාචාර්ය බෙල්ලන්විල විමලරත්න නායක ස්වාමින් වහන්සේ, පුජ්‍ය බෙනඩික් ජෝසප් පියතුමා, පුජ්‍ය රාමචන්ද්‍ර කුරුක්කල් බබුශාර්මාතුමන් මුල් කරගත් ආගමික නායකයින් ඇතුළු සම්භාවනියන් රැසක් ඊට සහභාගී විය. 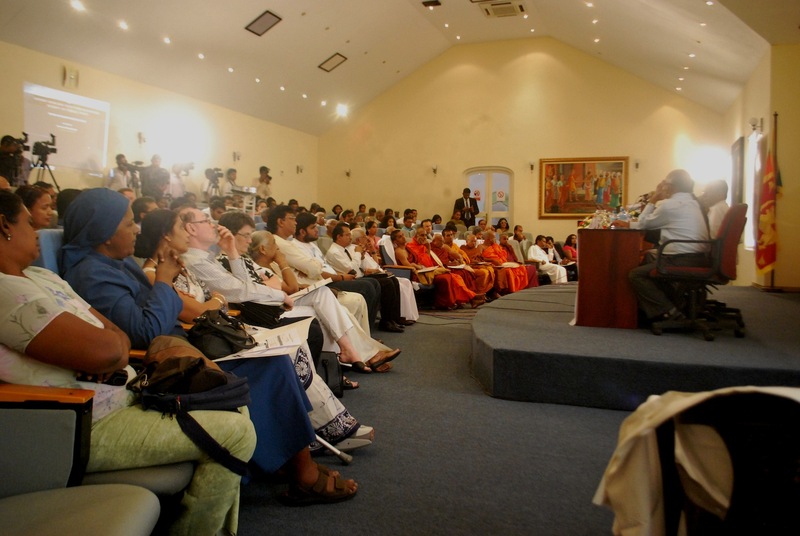 දේශපාලන ප්‍රචණ්ඩත්වය හා ත්‍රස්තවාදී ගවේෂණ පිළිබද සිංගප්පුරුවෙහි පිහිටා ඇති ජාත්‍යන්තර මධ්‍යස්ථානයේ ප්‍රධානියා වන මහාචාර්ය රොහාන් ගුණවර්ධන මහතා විසින් මෙම සමුළුව අමතා “ආගමික ප්‍රතිසන්ධාන සන්දර්භය” පිළිබද දේශනයක් ද සිදුකරන ලදී.